Nothing says summer like a lightweight, airy, flowy dress. Every woman should have a collection of easy summertime dresses in their closet, especially when pregnant! Whether they are short or long, nothing is easier or more comfortable than a loose fitting flowy dress. The maxi dress is perfect for spring. Slip it on with gladiator flat sandals and and a lightweight sweater (or jean jacket) for the daytime; at night, put on a heel and leather jacket. The relaxed boho fit works for day and night. When summer comes along, wear it to the beach on those sun soaked days and at night for dinner with a fun pair of earrings. The great thing about a flowy dress is that it is simple and easy to wear, but never boring. You can take a summer time dress from casual to dressy with the switch of a shoe and a few great accessories. Floral prints are also a great way to tap into spring/summer because they are fresh and flirty. 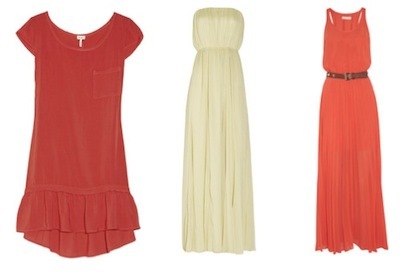 A summer dress can be an easy t-shirt dress with a fun detail like a ruffled hem or a cut out back, for a twist. This easy-to-wear look is a great closet go-to that you can throw on everyday. I know from my pregnancy that once I entered my third trimester, pants were no longer an option. They became tight, unflattering and bothered me around the waist line, but I refused to wear leggings everyday. The only pant that I could wear were my maternity jeans, but I couldn’t wear those every day either. Instead I threw on a dress or a jumpsuit, which felt comfortable and pretty. The summertime dress takes the thinking out of getting dressed. You don’t have to wonder if your top matches your bottom and whether or not you look put together. 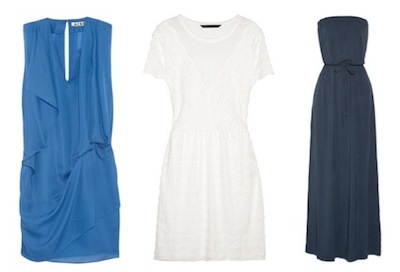 Dresses are so effortless that you will want to wear one every day. When you're in a dress, you know you look feminine and chic. The summertime dress will make a great addition to your warm weather wardrobe. Caroline Rahmey is a fashion designer who lives in NYC with her son and husband. Caroline went to FIT and later launched her clothing line, Caroline Hedaya. She recently started Nine Month Project, a fashion/lifestyle blog that helps motivate pregnant women to feel and look good. To read more about Caroline and her pregnancy fashion tips, click HERE.